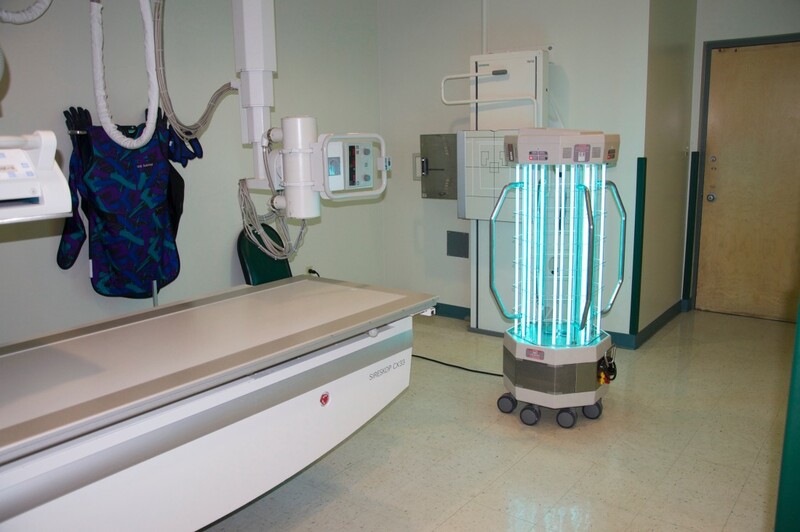 Most manufacturers of surface and air UVC disinfection equipment have designed products for hospital applications only; UVC Cleaning Systems manufactures equipment for MANY different industries. How many devices on the market can go up and down a staircase or have a wall mounted plug in model? UVC Cleaning Systems has taken a different approach to create more robust designs that are effective for hospitals as well as other environments. These devices can be used in laboratories, food processing plants, hotels, cruise ships, athletic facilities, out patient surgical centers and many other environments where harmful pathogens exist. UVC Cleaning Systems offers two different models to support many different needs. One model has eight medical grade casters that move in any direction and easily rolls from one surface to the next. This model has 4 stainless steel handles that act as crash bars to minimize accidents during transportation. The second model is the hand cart (HC) version. 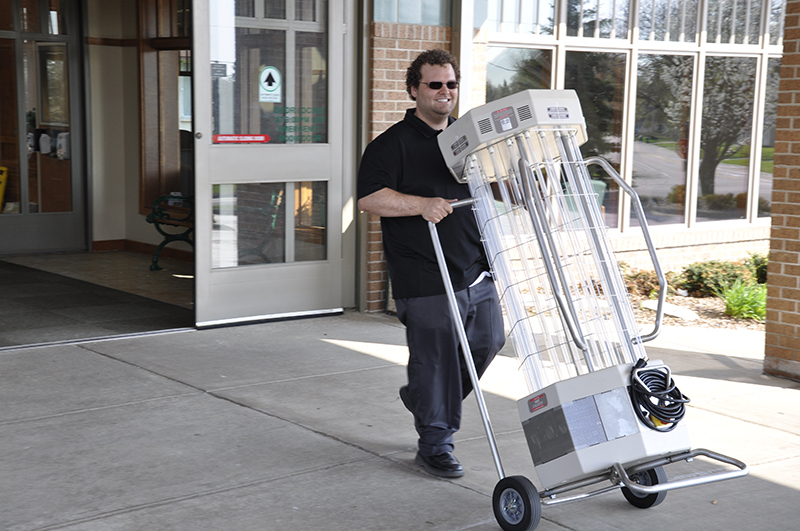 This device is designed to easily move from facility to facility, through parking lots, and up and down stairs. This is for customers that need to be in multiple locations. One person can transport this model in a van or truck. All UVC Cleaning Systems equipment is marked with clear, easy-to-read warning labels, and comes with a quick start guide and a comprehensive user manual (in English and regional languages) to ensure safe operations. Machine status is indicated on all sides of the device and on a simple three button remote control. The remote is paired to the device by simply inserting it into the docking cup on the unit. Up to eight UVC disinfection devices can be wirelessly linked together to eliminate shadows during treatment and increase safety. Once the treatment is completed, the devices are no longer paired and thus ready to start over. These simple operations minimizes confusion and ensures a safe, fast, and effective UVC treatment. Research has proven that higher UVC energy levels reduce the population of microorganisms more than lower UVC energy in the same period of time. How do you measure the effectiveness of a UVC cleaning device? One way is to culture the room before and after treatments and count the reduction in microorganism colonization. This process is not practical for daily operations. The infection control system needs a high degree of confidence that treatments are effective every time. UVC Cleaning Systems equipment measures the accumulated UVC energy to determine the length of the treatment cycle for a given area. The device also takes into account the efficiency of the UVC emitters to calculate the end point of the treatment. This is a better approach compared to timer based devices that use the operator to determine the end point of the treatment. UVC Cleaning Systems has created several different power levels of equipment (2340 watts, 1920 watts, 1300 watts) so that the customer can chose the maximum amount of power to get the most effect treatments within the electrical capabilities of their facility. 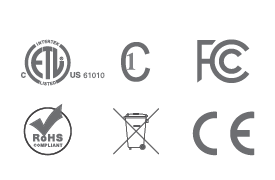 UVC Cleaning Systems equipment is certified with ETL, CE, CSA, RoHS and the FCC. These certifications ensure that the equipment will not create a hazard of fire, electrical shock, bodily harm, or interference with other electrical equipment. 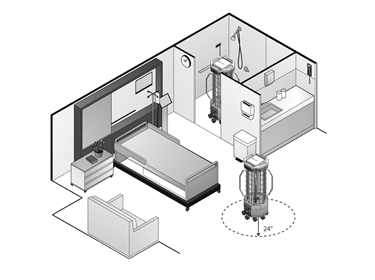 UVC Cleaning Systems devices are equipped with dual motion sensing technology for occupancy detection within the treatment area. This technology is certified to the National Electrical Manufacturers Association (NEMA WD7) standard to ensure a consistent and high degree of performance. The equipment can also detect a single component failure and alert the operator that “Service is Required” and the device will not operate until serviced. UVC Cleaning Systems is committed to producing the safest, most effective UVC disinfection devices on the market. UVC Cleaning Systems equipment is ETL, CE, CSA, and FCC certified and is WEEE, RoHS, and EPA compliant.